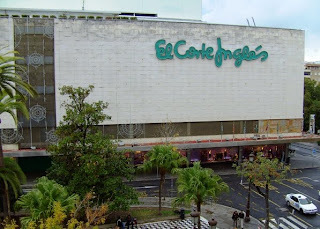 I am a frequent visitor to Spain and have always been impressed with the hosiery section of the leading department store in Spain – El Corte Inglés. The branch in the photo is the one in Seville. Most Spanish cities of any size have a branch, or even several branches. The selection of tights at El Corte Inglés is really impressive and puts most British department stores to shame. The focus is mainly on premium European brands, such as Wolford. What I particularly like is that they stock a great range of Italian-made tights, especially the Filodoro and Philipe Matignon brands. Both brands make tights in an excellent and accurate range of sizes, which is particularly important for male buyers. The 5 – XL size is the one I go for and the fit is always perfect. The yarns used are always top quality and I find that the tights wear extremely well and last for ages if looked after. I particularly like the range of 30-40 denier tights made by Filodoro and Philipe Matignon. These are not as thick as opaques but also not very sheer and are perfect for autumn weather. Many of the tights are also available in a matt finish, which I also like as it is not so obvious that I am wearing tights, not that I am particularly worried about that. On a recent trip I bought a pair of the Galerie 40 tights in the dark brown cappuccio colour. They are matt, sheer to waist and have a 9% Lycra content. The fit is excellent and they give an energising feeling to the legs. The price was €9.80 which I thought was good value given the impressive quality. I haven’t seen this brand of tights on sale anywhere in the UK, so I guess for now I will have to keep stocking up when I travel to Spain. Finally, the staff at El Corte Inglés are always really helpful and always offer assistance if you are browsing for tights. They seem fine about men buying tights for themselves and often recommend particular brands and styles.